The Diminutive Review: Superhero boots? Anytime boots? How about 80% off? Superhero boots? Anytime boots? How about 80% off? These snazzy, shiny Jenna-E boots by Primigi have been slashed in price by about 80% at Amazon. I have to believe that there are some little superhero or Star Trek Halloween costumes out there just screaming for such boots in red, dark brown or gray (as pictured above). 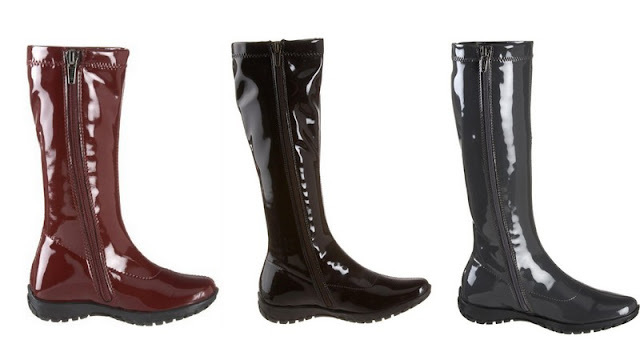 These three colors have the lowest price tag on Amazon and are available ONLY in size 24 (US 7-7.5). The prices range from $14 to $17.50, between 79% and 82% off the full price of $82. In addition to perfecting a Halloween costume, they would also be fantastic all fall and winter with dresses, skirts and leggings. Because they are Primigi, you can expect a well thought-out and comfortable footbed and high quality workmanship. And not to worry... these qualify for free Prime and Super Saver shipping (returns are free too). Update: Man, some of you were fast! Every pair of the extreme sale-priced boots has sold out as of tonight (7/29). If you missed out, do not fret. Amazon routinely has jaw-dropping prices on Primigi and other European kids' shoes. You'll get the next one.